The developer kit model of the Oculus Rift VR headset has gotten so unexpectedly popular so quickly that the company has run out of the components needed to make the thing. 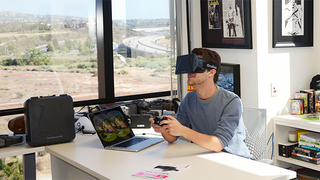 A statement on the headset's Reddit page says "Certain components used in the Oculus Rift developer kit are no longer being manufactured, meaning they are no longer available to us for production. As a result, we don't have the necessary materials to produce additional kits." Oculus still has a few of its old, original units left in stock, but once they're gone, there will be no more of these headsets made until they can find "alternate sources for the needed components". The shortage is testament to just how insanely popular the headset has become; the model currently on sale is intended for developers only, but has nevertheless sold over 50,000 units, a figure the company "never expected" to reach. Note that only the original developer unit appears to be affected; no mention was made of a widely-expected, and improved model that's surely due soon. We've checked in with the company about that, and will update if we hear back.